Awning windows offer a stylish and space efficient solution to your window requirements. Hinged from the top, and opened with a lockable winder, awning windows provide excellent ventilation, as air can circulate through both sides of the window sash. In addition, they provide a large glazed area, perfect for allowing uninterrupted views of your surrounds. 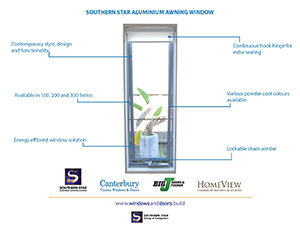 Our awning windows are available in both Southern Star aluminium and Canterbury timber. The Canterbury timber awning window is one of the most popular styles of windows in our range. They offer scope for different bar configurations, whilst maintaining modern lines and maximum glass area. Awning windows are a stylish and functional option that offers plenty of versatility and benefits. Visit our website, showroom or contact a sales member to learn more about awning windows today.